Home / Uncategorized / How Do You Determine the Right Level of Suffering? 10 Responses to How Do You Determine the Right Level of Suffering? I feel like humans are really good at finding new ways to suffer. And I think many of those ways offer new opportunities based on the challenges faced by the next generation. For example, this time last century it was considered by many to be unhealthy to exercise like we do today. ‘Obviously you’ll just wear yourself down for no good reason.’ Now we have gym memberships and personal trainers who encourage us to push ourselves beyond what we thought were our limits. Or you could look at it from the perspective of the rising generation. Maybe when you live in the bush you need to be perceptive to the possibilities of dangerous animals and be conditioned to making a quick escape. But do you ever face the dangers of getting doxxed, identity theft, or becoming the subject of a reputation-destroying viral social media campaign? Maybe those don’t sound as bad as the cougar or the venomous snake, but since large segments of the population seem to think that “he once believed something bad back in college” merits permanent expulsion from the workplace and polite society, perhaps ‘kids these days’ are more perceptive about what what constitutes real danger than their parents are. Don’t get me wrong, I share your curmudgeonly outlook. I just try and take it with a grain of salt, remembering that I don’t have the same skin in the game that they do. I’m probably not even playing the same game anymore. Returning to the hygiene hypothesis, by eliminating true pathogens we don’t eliminate the body’s immune response, it just finds something else, peanuts being the most common example. Note that you said we find new ways to suffer, not new sources of stress. Isn’t suffering just our immune response? I agree we’ll always suffer, but if we suffer without genuine challenge is it the right kind of suffering? I’ll admit that this is a distinction I should have made more clear. I do agree that gym membership qualifies as “good” suffering, but how many people really “suffer enough” just going to the gym? A quick search says 20% (https://www.cbsnews.com/news/cdc-80-percent-of-american-adults-dont-get-recommended-exercise/) if we assume that nature provided 100% of your daily recommended allowance of suffering historically we still have 80% who aren’t getting it and that assumes that you can get it all from going to the gym, which I doubt. Moving onto the dangers you mention, I agree that those are real dangers but do they trigger the correct evolutionary response? Do they create hormesis? I don’t know, I guess I hope so, but I think Lukianoff and Haidt would argue otherwise. I’d be cautious about applying HH here, partly because there’s so much about it that we don’t exactly know. For example, it’s not the elimination of all pathogens, or even a significant proportion of pathogens that seems to be the problem. It’s certain types/classes of pathogens. And even then, it’s not like their elimination triggers autoimmune/autoinflammatory responses in everyone, just in a certain subset of the population. And again, the specific response type appears to vary, such that one person might develop severe asthma and another person develops a mild allergy to peanuts, or a myriad other things. Probably the best solution to this issue, and one that is being tackled from multiple directions, is to reintroduce organisms into the body that can act as part of the normal flora and simultaneously provide the protective benefits HH postulates. But this is hard to do if you don’t really know what caused the (very recent) shift that eliminated the protective pathogens in the first place. For example, a colleague of mine studies a specific type of bacteria growing in the guts of mice that – if present – sensitizes them to development of asthma, IBD, etc. She additionally found that depending on the vendor you buy your mice from, they might or might not have that bacteria. Why does the vendor matter? Probably because the food one vendor buys has a different mix of vitamin supplements, and the presence of certain vitamins (for reasons my friend didn’t exactly know when I was working with her) prohibits the growth of those bacteria. All this as preamble to say: just because we think we know a mechanism doesn’t mean we should be confident about either the underlying problem or the solution. Maybe you think, “I’ll take some probiotics to boost by good bacteria.” And if we ignore the myriad reasons from a microbiology perspective that this is probably a dumb strategy, we still have to ask: if you were initially exposed to those bacteria before, why do you need to keep amping up your GI tract with them again and again? Maybe the problem isn’t exposure/dose. Maybe the problem is diet. Or maybe it’s something else. Bringing this back to suffering, I’m skeptical that homo sapiens, which has done remarkably well at adapting to a diverse set of circumstances, has suddenly run into a wall of complacency beyond which we cannot pass. Why now? The old argument was “Perhaps we think we just have so much comfort that we can stop all progress and focus on luxury”, but that argument is at least a hundred years old and not what you’re focusing on. If that were a ‘filter’ a la Fermi’s Paradox, surely we passed it long ago without a passing glance. If, instead, what we’re really looking at is the social equivalent of autoimmune disease, that’s many times preferable to the social equivalent of frequent outbreaks of polio and smallpox. If the analogy truly does hold, perhaps we should conclude that this is likely to be a minor annoyance on a species-wide level (even if it requires significant individual adaptation), but will hopefully be something we learn to treat within a generation or two with genuine solutions based on a mechanistic understanding of the underlying chain of causation. Biology and sociology are complex, but not intractable. I guess part of what you’re saying is that you suspect the “beneficial stressors” of yesteryear are not being replaced by other beneficial stressors. That in essence we’ve traded endemic hookworm for drinking probiotic smooties, such that we think we’re helping, but we’re really doing nothing of the sort. Except you could take that a step farther and say, “what if exposure to large amounts of sugar causes the floral shift that induces autoimmunity in some people?” And your probiotic smoothie is full of sugar, so not only are you not treating the problem, you’re exacerbating it. Similarly, what if ‘eliminating sources of mental distress’ is not only a bad way to treat the problems brought on by the social easing of modernity, but is actively sensitizing kids to future sources of mental distress? It wouldn’t be the first time a wrong theory of human fitness had a dramatic negative impact on human development. A hundred years ago it was widely held that contamination of the gene pools of certain human lineages with more primitive human lineages would cause imminent civilizational collapse. That whole idea was super wrong, but was also endorsed by nearly every major intellectual figure of the early 20th century. It spawned embarrassing massacres of humans before we were able to collectively agree that it was a bad idea. Hopefully similarly wrong ideas that are widely adopted will not require similar atrocities to fix them. I’m skeptical that they represent, as a class, filters under the Fermi Paradox, but I would agree they can be bad. I think this is more in line with my thinking, and perhaps a better example that what I used. For example no one would argue that college kids aren’t stressed, but in Coddling they argue that focusing on how harmful stress is actually magnifies it’s effect. Instead you should be looking for ways to incorporate stress into a narrative of how it’s made you tougher not more of a victim. And as you point out we certainly have a history of doing exactly the wrong thing, bloodletting being the example that most easily comes to mind. I’m a bit skeptical here. Kids are too pampered, yet wasn’t it only a short while ago we were being told the kids were little monsters going around beating up poor innocent college professors who told a bad joke or advanced an unpopular or misunderstood thesis? Did we forget “Occupy Wall Street” but a few years ago? I think Erza Klein’s response to Andrew Sullivan might be helpful here (https://www.vox.com/policy-and-politics/2018/12/11/18131370/andrew-sullivan-religion-tribalism-christianity-trump) as well as the question of whether this is just an availability bias at play. When you were in young and in college you had stupid ideas, got upset at stupid things too. Back then there was no ‘click bait’ looking to preserve and exploit you for all of history. The big mistake I think is both mom and dad and kids all on Facebook at the same time. The sedentary issue isn’t as important as it seems. In 1900 we were mostly sedentary as well. Yes there were physical jobs but they were often backbreaking. It’s easy to imagine lumberjack man with huge muscles taking down trees, the reality was more like coal miner dying of black lung at 40 years old for physical jobs. Today physical jobs are often not the route to physical supremacy. When was the last buff plumber you saw? They are on their feet all day yet everyone one I ever hired looked the complete opposite. Cheap carbs and quite frankly bad diet advice over the last 20 years are to blame (carbs good, fat bad, eat bread with margarine not meat with butter…all bad ideas we are just getting away from now). I think I’m on Sullivan’s side here (though I don’t want to get into it here, and I would agree that there was no halcyon day of procedural politics) but as far as the dichotomy you think you see between being bullies and being too pampered, most research indicates that it is precisely having an overinflated self esteem that leads to bullying. (https://www.psychologytoday.com/us/blog/intense-emotions-and-strong-feelings/201010/do-bullies-really-have-low-self-esteem) That said I agree that whatever is going on Facebook is making it worse. I was trying to point out that we might be able to get by on the current bad diets if we also weren’t sedentary, but that eating is the primary driver. And even if we restrict ourselves to just looking at eating we’re still in the realm of supernormal stimuli, where the food today is extraordinarily good at providing calories without saity. Carbs are very good at that. Release insulin and the body stores fat in fat cells and exhausts sugar for energy. The brain, upon suddenly seeing a lack of energy, becomes alarmed and you then have ‘cravings’. Eat bread with every meal and you’ll feel hungry before every one of your three squares a day. Eat fat, protein and little or no sugars/carbs and you’ll probably feel fine with one or two meals a day. But activity?! Not really. Ever watch how long you have to be on the bike to register 100 calories burned? Then look at how many calories you can eat in 30 seconds with a bunch of cookies. You’re going to need hours of training to overcome the overload and have to fight your body, which will desire more food as you exercise more. It doesn’t change the insulin cycle either. Every time you release insulin, your cells start to resist paying attention to it and you become ‘insulin resistant’. Professional athletes who consumed huge amounts of carbs develop diabetes quite soon in their retirements despite the fact that their bodies were in great condition before. There was a time not too long ago when it was socially acceptable to smoke. When the social statement was not whether you smoked, but what you smoked. Cigars? Cigarettes? Pipe? Now, decades later, we’re still suffering from the bad advice of yesteryear. Including a couple of our patients this week, former smokers who now have cancer. Now we have the three leading causes of death in the US, all linked to bad nutrition advice. Maybe the biggest cause of suffering is shifting toward self-inflicted? 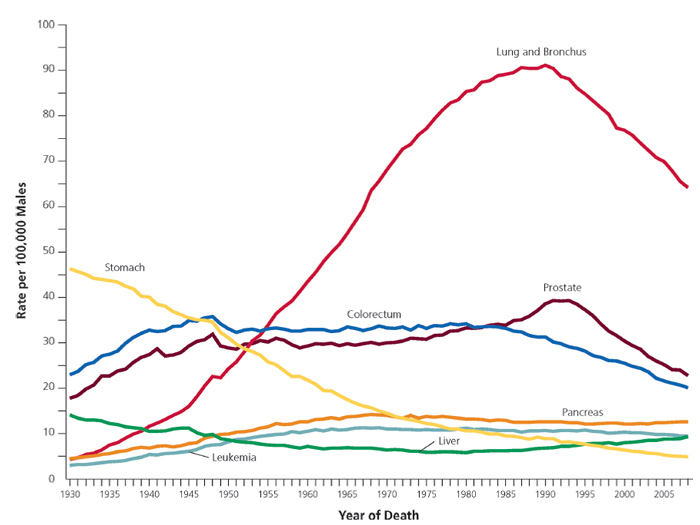 It appears we hit peak lung cancer in 1990 or so. We’ve been sliding down the scale ever since as smoking has pulled back dramatically and the “five pack a day” generation dies off. Even today a ‘heavy smoker’ is a pack a day or slightly more. Asbestos, likewise, has been mostly neutralized with cancers today being due to damage done in the long past.